B.C. 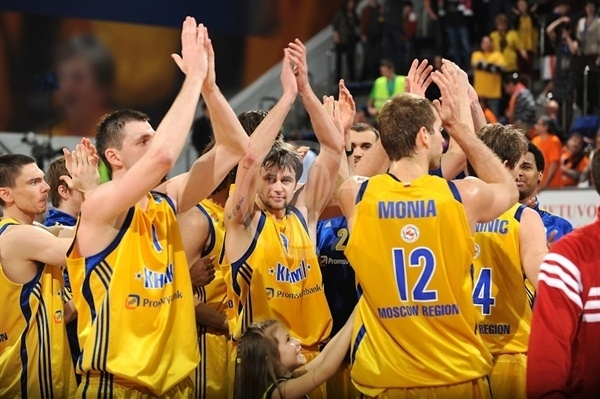 Khimki Moscow Region has made it to the Eurocup finals! Khimki managed to make it to the title game for the second time in club history by edging Spartak St. Petersburg 77-73 in the second semifinal on Saturday night. Khimki now has the chance to battle for its first Eurocup title against two-time champion Valencia Basket. 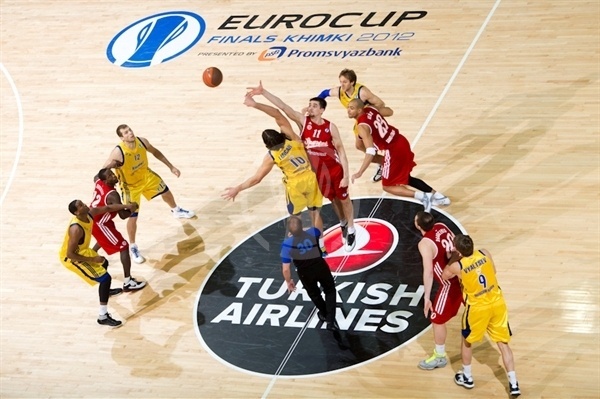 The winner will also earn the right to play in the 2012-13 Turkish Airlines Euroleague. 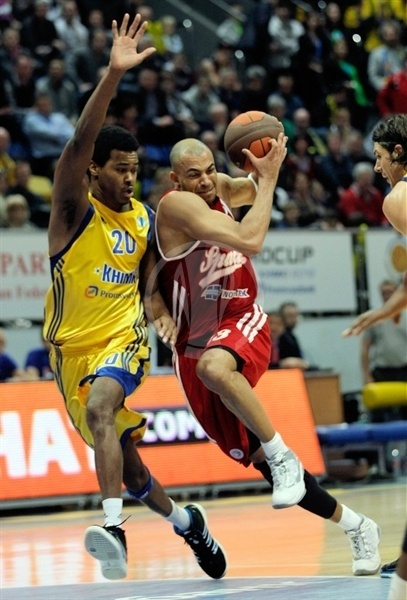 Spartak will try to bounce back right away in the third place game against Lietuvos Rytas. 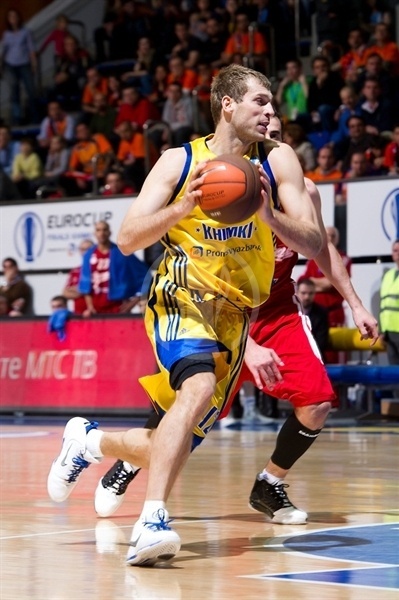 Vitaliy Frizon led the winners with 16 points. 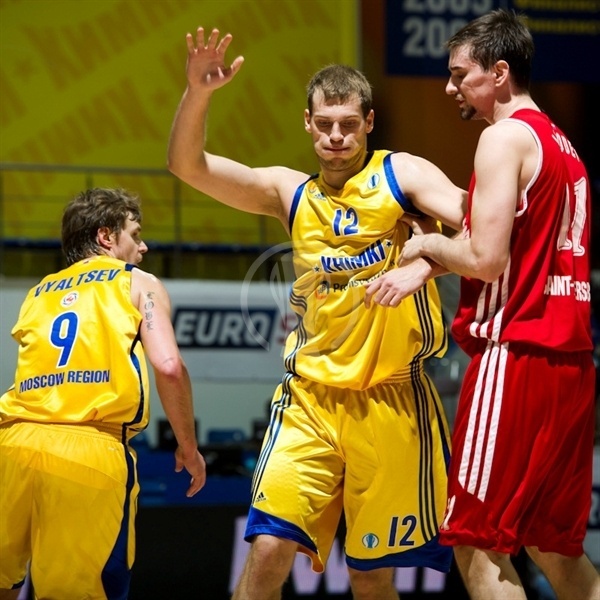 Kresimir Loncar added 13 and 9 rebounds, Zoran Planinic had 12 points while Thomas Kelati got 10 for Khimki. Patrick Beverley and Yotam Halperin led Spartak with 15 points apiece. Valery Likhodey added 12 while Vladimir Dragicevic got 10 for Spartak. Planinic and Kelati shined early to give Khimki a 27-14 margin after 10 minutes. Khimki still led 39-26 late in the second quarter but Likhodey and Beverley allowed Spartak to get within 42-38 at halftime. Spartak kept rolling after the break, as an outstanding Halperin and three-pointers by Vasily Zavourev, Beverley and Likhodey gave their team a 56-66 margin. Fridzon and Sergey Monya fueled the hosts' comeback but a jumper by Dragicevic tied it, 73-73, in the next-to-last minute. Free throws by Loncar and Planinic and a big block by Fridzon allowed Khimki to make it to the title game. Beverley got Spartak going with a six-meter jumper that Planinic erased with a driving layup. Monya struck from downtown, as Spartak struggled to get Beverley and Halperin involved. Meanwhile, a three-point play by Planinic boosted his team's lead to 8-2. 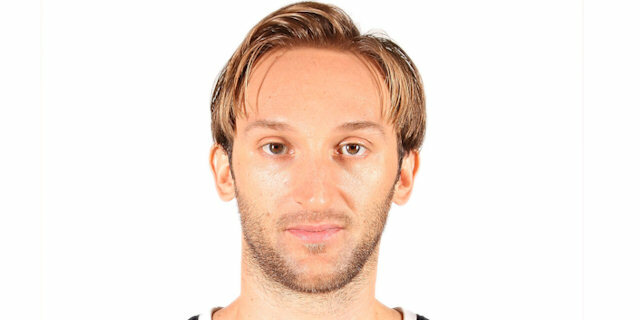 Dragicevic scored around the basket and a corner three-pointer by Halperin got Spartak within 8-7. Kelati stepped up with a driving layup but an uncontested slam by Beverley kept his team as close as 10-9. Loncar shined with a power layup, as Spartak struggled to adjust its defense late in the first quarter. Khimki kept running its offense through Loncar, who fed Fridzon for an open triple, making Spartak call timeout at 15-9. Planinic scored in the low post but Dragicevic matched that with a jump hook and Halperin struck from downtown for a 17-14 Spartak deficit. A long jumper by Matt Nielsen and an acrobatic three-point play by Fridzon soon made it an eight-point game, 22-14. Kelati followed a fast break layup with a corner triple to cap a 10-0 run and give Khimki a 27-14 lead after 10 minutes. Dragicevic tried to ignite Spartak's comeback with a tip-in early in the second quarter, as Nikola Dragovic stepped on court for the first time in this Eurocup season. Chris Quinn swished a corner triple but Khimki struggled to find open shots now. 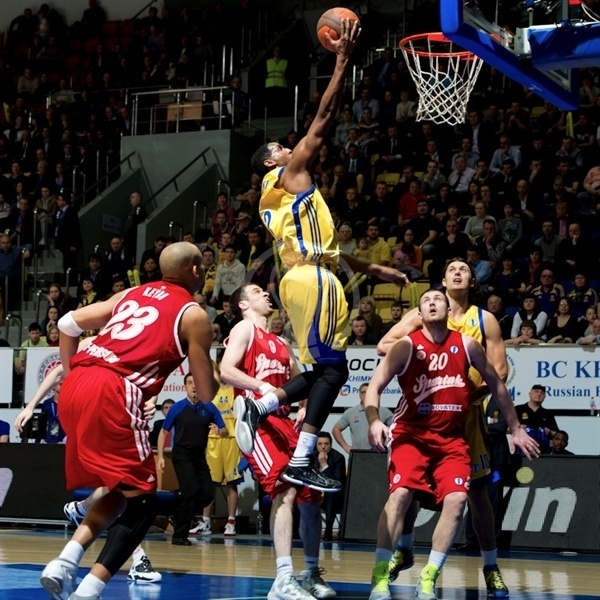 Miha Zupan scored around the basket but Mickael Gelabale buried a five-meter jumper for a 32-18 Khimki lead. Aleksey Zozulin buried a wide open three-pointer in transition and a fast break layup by Zupan forced Khimki to call timeout at 32-23. 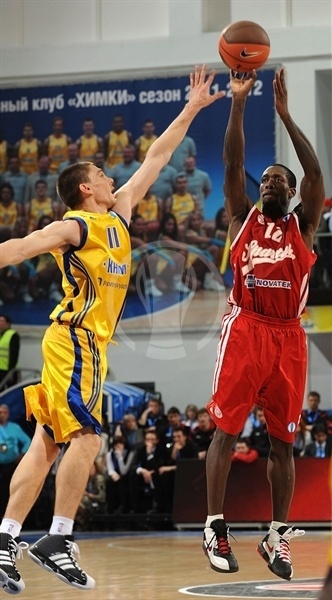 Beverley took over with a three-pointer but Spartak had entered the foul bonus and Khimki took advantage of that. Planinic and Loncar made free throws to make Khimki restore a double-digit lead, 39-26. Anatoly Kashirov shined with a tip-in and a three-pointer by Likhodey gave Spartak some hope at 39-31. Khimki kept struggling to score but kept playing aggressive to go to the foul line often. Gelabale split free throws but Viktor Keyru joined the three-point shootout for a 40-34 Spartak deficit. Aleksey Zhukanenko shined with a put-back slam but Likhodey followed free throws with a triple to keep Spartak within 42-38 at halftime. Beverley buried a three-pointer immediately after the break but Loncar answered with a turnaround jumper in the lane. Halperin sank a big triple that tied the game, 44-44. 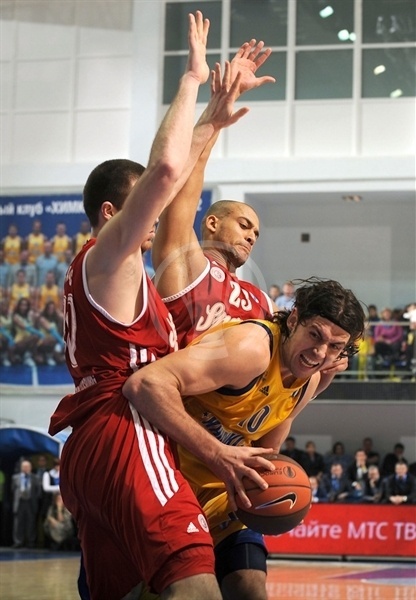 Spartak kept playing physical on defense and a layup by Keyru gave his team its first lead, 44-46. Loncar tried to change things with a put-back basket that Dragicevic matched with a baseline jumper. Fridzon quickly answered from downtown to put Khimki back ahead, 49-48. Halperin kept pacing Spartak with a wild layup-plus-foul and free throws by Beverley gave his team some fresh air, 49-53. Quinn shined with a one-handed floater that Zozulin erased with foul shots. Spartak stayed aggressive on defense and finding open shots. Likhodey stepped up with a put-back basket that Egor Vyaltsev improved with a bomb from downtown to keep Khimki within 54-57. Loncar made free throws but a three-pointer by Zavourev gave Spartak a 56-60 margin after 30 minutes. Beverley nailed a three-pointer early in the fourth quarter but picked up his fourth foul right after that. Likhodey downed another one from beyond the arc to make it a double-digit game, 56-66. 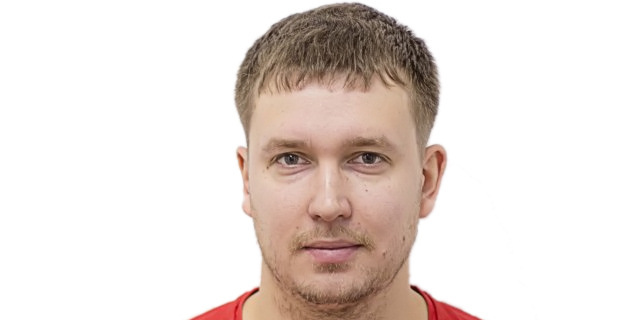 Kelati stepped up with a corner triple and Vyatlsev added a long two-pointer in transition that to force Spartak to call timeout, 61-66, with 7 minutes to go. Monya buried another one from downtown to cap a 9-0 Khimki run, turning the game into a thriller. Loukas Mavrokefalidis hit a jump hook but Monya struck again from beyond the three-point line and free throws by Fridzon completed Khimki's comeback, 69-68. Halperin provided a highlight with a catch-and-shoot triple but Fridzon answered from downtown for a 72-71 score. Spartak struggled to score right when it mattered and a free throw by Fridzon gave Khimki a 73-71 edge with 2 minutes left. Dragicevic took over with a critical basket and Loncar split free throws for a 74-73 edge. 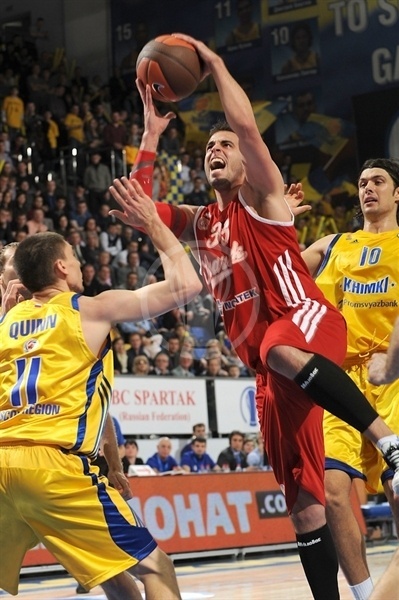 Dragicevic missed the go-ahead shot and Spartak fouled on Planinic, who made 1-of-2 attempts with 26.4 seconds left. Monya collected a key steal and Planinic returned to the foul line, but missed his second attempt. Spartak had a chance to tie the game but Fridzon blocked Kashirov's three-point shot to seal the win in style. "First of all, I am happy that we won. It was a tough game. We thought it would be beforehand, because it's the third time we play Spartak and all of the games were the same. We knew that we needed the maximum energy and effort to win the game. At the beginning of the game, you saw us get a big advantage and it looked like we might beat them almost easily. 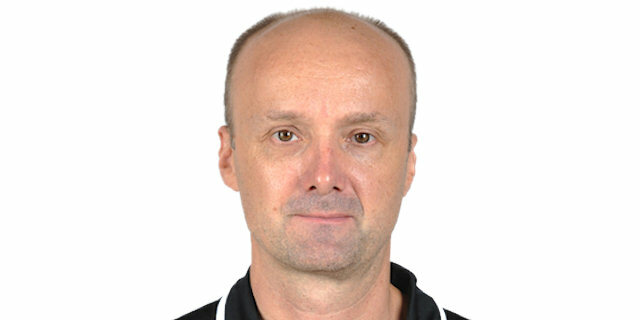 But Spartak is a very good team with a very good coach. We gave them oxygen to come back, and they took over the game, and made it very tough on us at the end. For that reason, I want to thank my guys for the energy and the character they showed tonight on the court." "Giving up the lead, this season we have had this problem. Usually we lead after the first two quarters. Some games like this we led by a lot like this, or in the quarterfinals against Lokomotiv had a advantage in the series and fell behind again. But in the end we saved it and that's why we're at the Eurocup Finals. It's something wrong with our team, losing leads, but we are better than last season. In the end, the lead helps because Spartak maybe had to use a lot of energy to make up 14 points and then more to lead by 10. We got our spirit back and won, but this is something that usually happens to our team this season." "Some games this season we make 90 or 100 percent of our free throws. Today, we missed a lot of them. I think everybody was nervous knowing how important this game is. Also, I played with seven or eight players and some other guys who just came in for a few minutes to give the others some rest. So the free throw shooters were tired, too. Fridzon almost never misses a free throw. We have to make it better for next game. We also have problems lately scoring under the basket. The last few games we are at 45% or so. But if we want to win tomorrow, we must make all the shots, at the free throw line and under the basket." 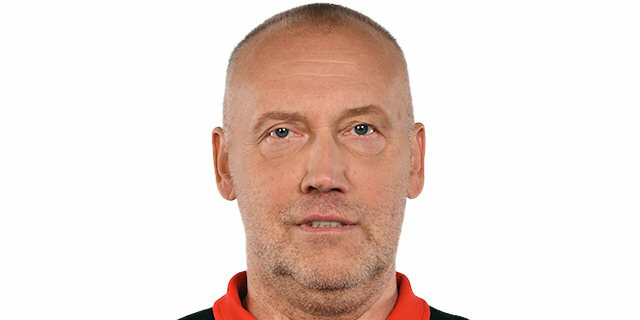 "Congratulations to my colleague Rimas Kurtinaitis and his players. They beat us again. We tried hard, but in the end, we really didn't play smart. We played hard but not smart. We lost maybe to them in the same way we did our first game here in the Russian League. We relaxed a little when we had a lead. It's unforgivable that we don't put our hands up against their shooters like Kelati. Instead, we watched them shoot. This is something that I cannot forgive, especially not in this kind of game. We didn't start very well. We were really bad. We respected the opponent too much. After we got our rhythm we played harder and played better defense. Still, we didn't rotate well and didn't use our fouls well, and they punished us. We were not smart at the finish, as you see. I didn't take a timeout and I had one more, but they were missing some late free throws. We wanted to win this Eurocup. It's not finished. We've got one more game tomorrow. We will try to play hard. But what can we do? Maybe next year." "On the last shot, because we knew that Khimki was not in the bonus and could make one more foul, we chose Anatoly Kashirov, who is a very good shooter. We wanted to surprise the defense of Khimki. He makes a lot of shots from the corner, and for this reason, I decided to put him in and try to have him make the shot. In the end, it was not a good decision. I don't know what would have happened if I had put somebody else. 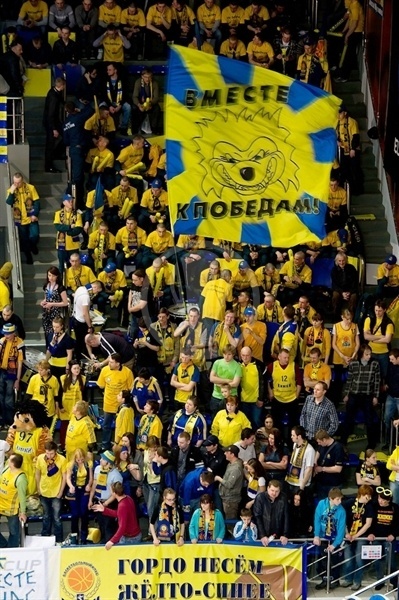 Khimki read what we wanted to do. Maybe he should have faked, but the ball went to the right man, yes." "Spartak is such a good team. We excpected anything in this game. They let us back in the game when it was the worse situation for us, but then again, we did the same when we were controlling in the first half. Whan you have your momentum going it's hard to stop. You saw how the game was solved, it almost came down to the very last second. Now, against Valencia, we will have a difficult game. Another one. The last step this season." 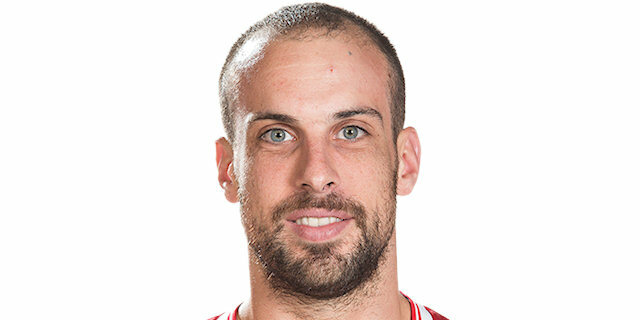 "We have worked for this the whole year and the Eurocup title is just one win away. Valencia is a tough team, very aggressive. We will try to play a little bit slower and see what we can do tomorrow. We have to forget about this win. I committed some turnovers but there is a new game tomorrow and the team needs to approach it. I think Spartak had a bad start and were a little but nervous in the beginning but they relaxed when they were down by 14 and started to play better, much more aggressive in the second half. I am glad we pulled through and won the game." "It was a difficult game. We played a good first half but in the last minutes of the second quarter we let ourselves down. They are a very good team and we allowed them too much inspiration. They performed well. The way we shot in the last quarter however I think will help us tomorrow. We showed that we didn't give up in any situation and that we will fight in any situation. Today Valencia showed they are a better team and I am sure we will have a big battle in te final." "I don't know what happened, man. I am still trying to get my thoughts together. It was a great game, amazing game. But they shot the ball extremelly well. We are happy to have been so close to the championship. When we play Khimki it's always good games. Both teams are tough. We are at leat happy one Russian team made it to the final." "You know it's a very strange feeling about this game because after the first quarter we were playing very good. We were even leading by 10 points. I think that everybody thought it was in our hands to win this game, but we relaxed a little bit. They did three triples in a row, two by Monya and one by Kelati from the corner, and maybe we broke down a little bit. We couldn't score for a long time and also hadsome foul troubleplus I'd say we lacked a bit of good luck in the end." "Our previous two games were very close and we expected this to be the same. Unfortunately, Khimki managed to beat us again but I am proud of everybody in my team. We played great in the second half but I guess it was not enough. I think we had too many turnovers, especially in the second half. Every time you make small adjustments that don't work, a team like Khimki punish you immediately. As for the final play, I tried to pass inside but unfortunately, Khimki didn't let the ball get there. These things happen."